Does Facebook Have a Secret Paper Fetish? How did Barry get the jump on his boss? Well, he printed the poster. As co-founder of the Analog Research Lab, Barry is one of several people at Facebook who carve out time from their other duties to spread Facebook’s grassroots gospel around the company’s campus. 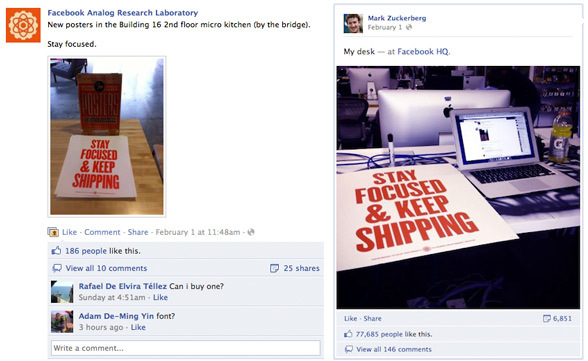 On the day Facebook announced its IPO, the Analog Research Lab had spread word of a new poster by noon. By 5pm, CEO Mark Zuckerberg had posted a photo of his copy. 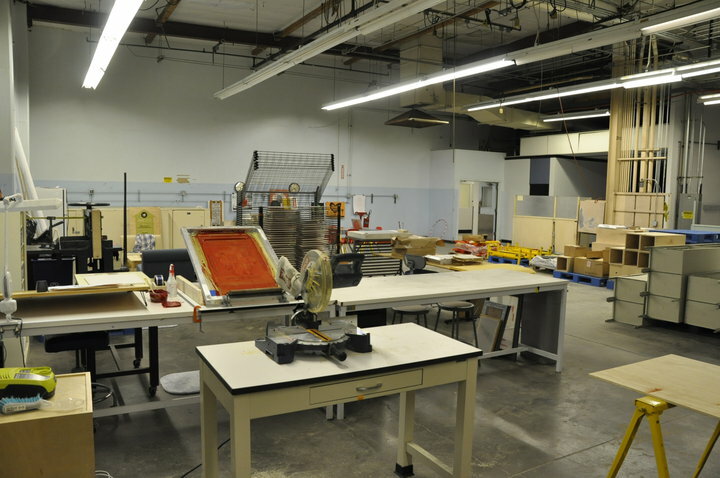 A view of the “Lab,” which bears a striking resemblance to a print shop. On paper, Barry seems an unlikely individual to help set the corporate tone for a company with an estimated $100 billion valuation, but maybe that’s why he’s had such an impact at Facebook. A graduate of the University of North Texas in Denton, where he studied communication design with an emphasis on graphic design, Barry spent a year in 2007 and 2008 working at The Decoder Ring in Austin, where he assisted various visiting artists with their specialty screenprinting projects. Before he was hired at Facebook in the fall of 2008, there were only two people on the communication design team. The week Barry joined the company, the team grew to five. “When I left Decoder Ring and came to Facebook, I didn’t have access to a print studio anymore. 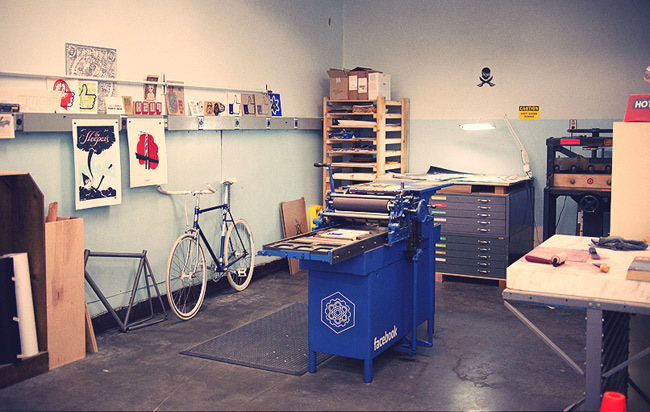 Even as early as my interview at Facebook, I was discussing with the designer who became my manager the idea of screenprinting posters here. So it was always an idea that I was kicking around. Barry hopes to relocate the Analog Research Lab to Facebook’s new Menlo Park, California, headquarters this summer. 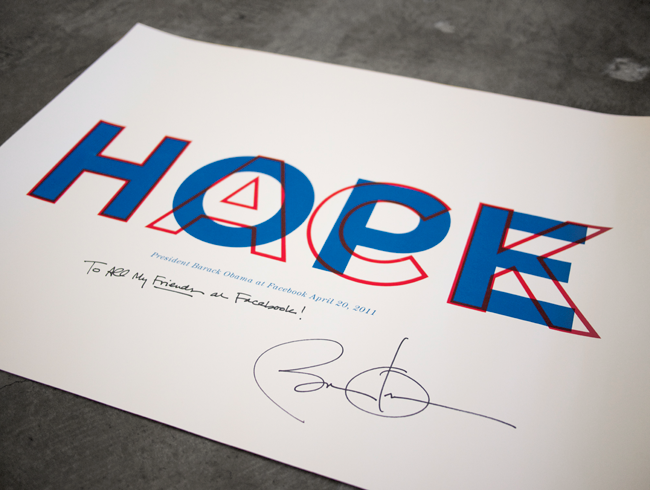 When President Obama visited Facebook in April of 2011, he autographed a copy of the Analog Research Lab’s “HACK HOPE” poster. But wouldn’t posting Facebook’s internal messaging on, oh I don’t know, Facebook be even faster? “I think print and paper have a place at Facebook,” Barry maintains. “In the past, you’d make a poster for a concert, movie, or something like that because it was the most efficient way to distribute information about when an event was and how much it cost. But all that sort of information has been completely cannibalized by the Internet. That traditional function of a poster, to actually distribute information, is gone because I can get it through Facebook, other websites, and so on. 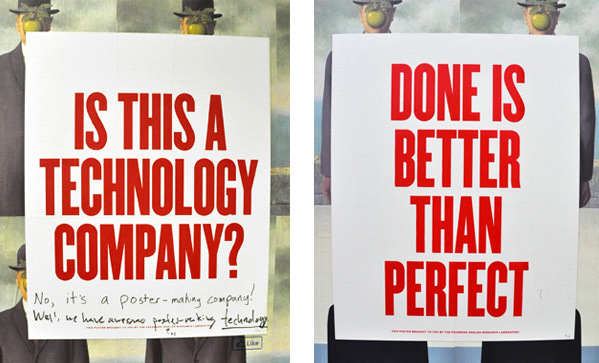 The Lab’s propaganda-style posters are meant to provoke comments, and often do. 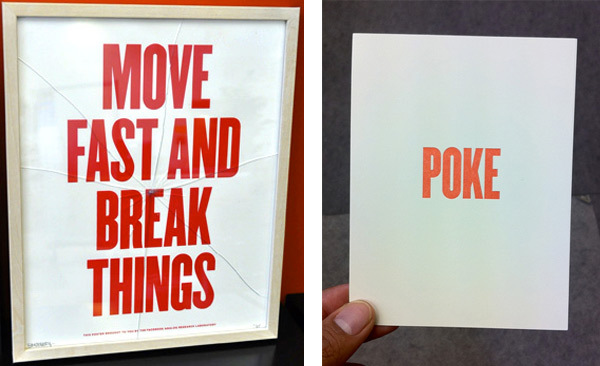 The frame on this “MOVE FAST AND BREAK THINGS” poster appears to take its message to heart. At right, a “POKE” postcard pokes fun at the Facebook term for getting another Facebook user’s attention. 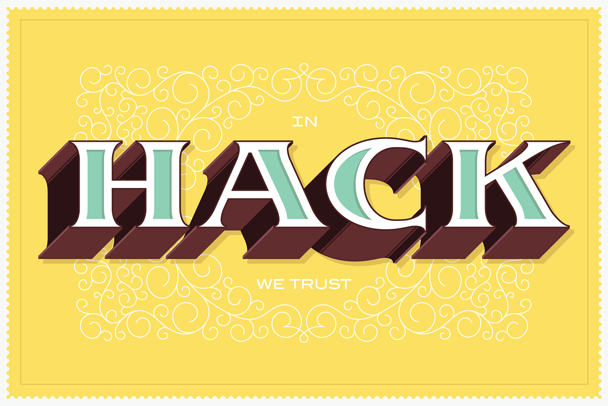 “IN HACK WE TRUST” was screenprinted in nine colors for a 2010 Hackathon at Facebook. 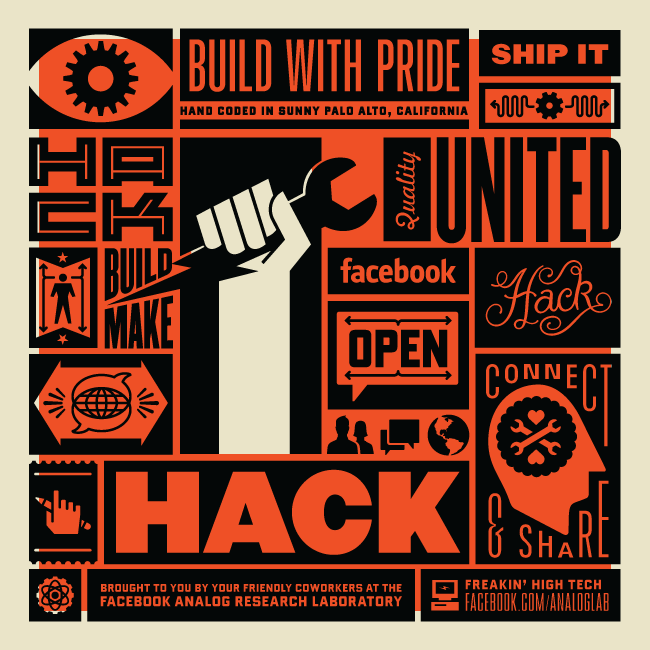 When it comes to posters, some of the most shared images produced at the Lab are the ones created for Facebook’s periodic Hackathons, including Barry’s nine-color screenprint that reads “IN HACK WE TRUST.” “When I first came here, Facebook was already doing these Hackathons, where engineers and anyone could come together and work on a project or idea that maybe they haven’t had time for in their day job. It usually starts at about 8 o’clock at night and goes until 6:00 in the morning. The energy level is really high as people rapidly prototype their ideas. At the end, everyone gets up and gives a two-minute pitch. It takes hours to get through everything. It immediately struck a chord with me. For Barry, one of the most satisfying results of the posters he’s created at Facebook may be the appearance of ones he hasn’t had anything to do with at all. “Recently, our security team commissioned a Hack poster that they put it up, so people here have taken to this poster culture. Posters I have nothing to do with pop up all the time, which is pretty awesome.” Presumably, that’s how Mark Zuckerberg feels about the Analog Research Lab’s posters, too. It was a MacBook Air, not a MacBook Pro. “ ” Folk art is not an empirical category, and it does not exist without collectors.